JAM 2019 application form will be open from September 1, 2018 (Saturday). JAM application form is nowadays filled by only computerized online method. This method is called JOAPS (JAM online application process system). Last date of JAM 2019 application form to be upto October 1, 2018 (Monday). You can fill your JAM 2019 application form in between these days. For avoiding last time rush you must fill your JAM 2019 application form in mid dates. JAM office also provide a facility to change the exam center after filling your JAM application form & also after closing date of JAM application form. If you want to change your exam center city you may change as per your requirement. Admit card will be available to download from JAM organizing institutes site from January 4, 2019 (Friday) for printing. You may download your admit card whenever you want to download just log in to your JAM account and download. 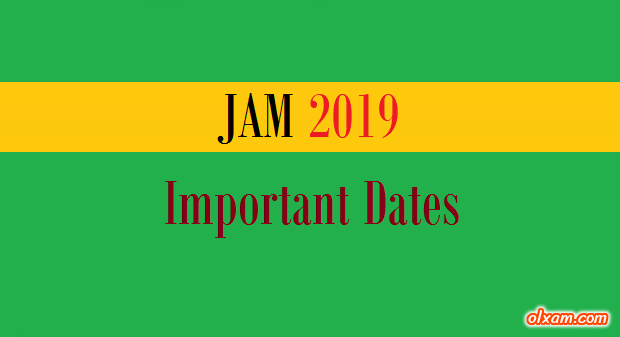 JAM 2019 exam to be conduct on February 10, 2019 (Sunday). JAM exam is nowadays an online exam for almost all engineering/science streams. So this exam take nearly one month to conduct its all exams of all engineering/science branch. Nowadays JAM exams conducted only on Saturday and Sundays. JAM 2019 result will be announced by JAM office on March 20, 2019 (Wednesday) just after ending online JAM 2019 exams. You may check your result from your online JAM 2019 application account. From 2015, JAM office also providing an online copy of your responses which you filled in your online JAM exam. You may check your responses from there and may calculate your marks roughly. Also you may know your silly mistakes which can help you to get good or better marks in future in the same exam or we can say it will help you to perform better next time.